Over the last few months, I’ve worked on several jQuery and jQuery Mobile projects. These are great frameworks for developing cross-browser web applications. There is so much you can do and so many ways to do it. 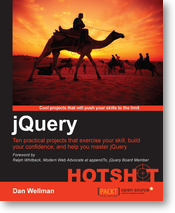 I was just taking a break for the first time in a long time when I downloaded Dan Wellman’s jQuery Hotshot from Packt Publishing. First, I’m new to Packt. They have a great Mobile Web App that I installed on my iPad. It features an HTML5 eReader that takes advantage of local storage so I can read their books offline. I’m impressed. It has several features like bookmarks that really work well. Actually, I like it much better than the Safaribooks reader. In every chapter, you will find useful and reusable code and techniques that will help you exceed expectations on your projects. Check out the publisher’s page at http://www.packtpub.com/.